Many people love to spread rumors saying that I have people “behind me” or that I’m being “paid” or “used” to do what I’m doing. But there is no one “behind” me except for myself. My parents were as far from climate activists as possible before I made them aware of the situation. My family has written a book together about our family and how me and my sister Beata have influenced my parents way of thinking and seeing the world, especially when it comes to the climate. And about our diagnoses. That book was due to be released in May. But since there was a major disagreement with the book company, we ended up changing to a new publisher and so the book was released in August instead. Before the book was released my parents made it clear that their possible profits from the book, “Scener ur hjärtat,” will be going to eight different charities working with environment, children with diagnoses, and animal rights. Some people mock me for my diagnosis. But Asperger is not a disease, it’s a gift. People also say that since I have Asperger I couldn’t possibly have put myself in this position. But that’s exactly why I did this. Because if I would have been “normal” and social I would have organized myself in an organisation, or started an organisation by myself. But since I am not that good at socializing I did this instead. I was so frustrated that nothing was being done about the climate crisis and I felt like I had to do something, anything. And sometimes NOT doing things—like just sitting down outside the parliament—speaks much louder than doing things. Just like a whisper sometimes is louder than shouting. Also there is one complaint that I “sound and write like an adult.” And to that I can only say; don’t you think that a 16-year old can speak for herself? There’s also some people who say that I oversimplify things. For example when I say that “the climate crisis is a black and white issue”; “we need to stop the emissions of greenhouse gases”; and “I want you to panic.” But that I only say because it’s true. Yes, the climate crisis is the most complex issue that we have ever faced and it’s going to take everything from our part to “stop it.” But the solution is black and white; we need to stop the emissions of greenhouse gases. Because either we limit the warming to 1.5°C over pre-industrial levels, or we don’t. Either we reach a tipping point where we start a chain reaction with events way beyond human control, or we don’t. Either we go on as a civilization, or we don’t. There are no gray areas when it comes to survival. There is one other argument that I can’t do anything about. And that is the fact that I’m “just a child and we shouldn’t be listening to children.” But that is easily fixed—just start to listen to the rock solid science instead. 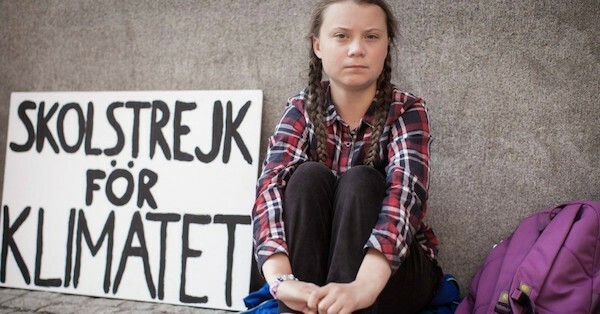 Because if everyone listened to the scientists and the facts that I constantly refer to—then no one would have to listen to me or any of the other hundreds of thousands of school children on strike for the climate across the world. Then we could all go back to school.